One reason I keep a sketchbook with me all the time: you just never know. You never know when you're going to want to capture something in front of you. You never know when you're going to have a long, unexpected wait, and sketching occupies the mind in positive and creative ways. You never know when one silly drawing is going to wind up being one of your favorites. This sketch is one that I just love. As you can see, it's just a few lines. 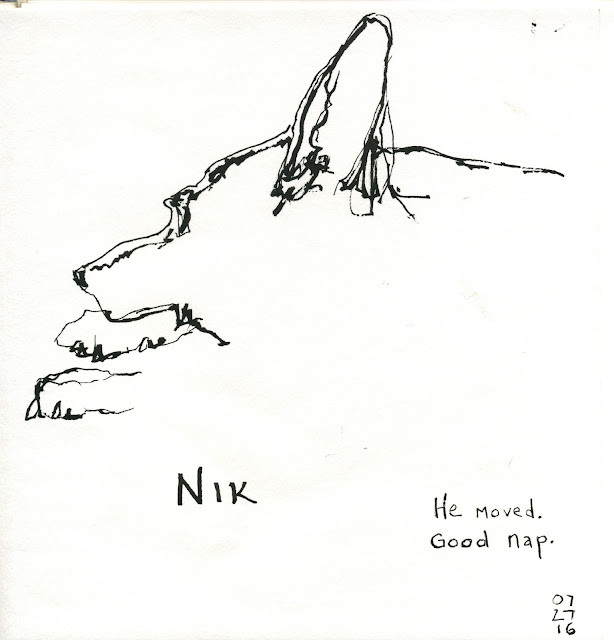 My dog, Nik, was napping and I thought I'd be able to do a slow set of drawings, because, hey, he's napping, right? Not likely to move. So I started with a warm-up semi-blind contour drawing. And then he moved. Not only moved, but left the room. I was bummed, my scribbling plans awry. And a very unfinished squiggle of not much taking up a whole page. But the next day, I realized I really like this contour. It captures his profile, and there's a simplicity to it that I just really like. So, you never know what's going to lead to a fun and meaningful drawing experience. Which is why I keep scribbling.